There are many things I remember fondly from my time on the banks of Lake Michigan. Sitting on a train for an hour every day was certainly – if somewhat surprisingly - one of them. I’ve often described how one of the best things about living in Chicago was the commute. It was about a half-hour train ride between my apartment and my office and that time gave me an opportunity to read for pleasure in away I never had before (and, sadly, never have since). But it wasn’t all about the journey - the destination was pretty great, too. When I’d arrive at the State and Lake Station on the "L" I’d descend the stairs and head north on State Street. 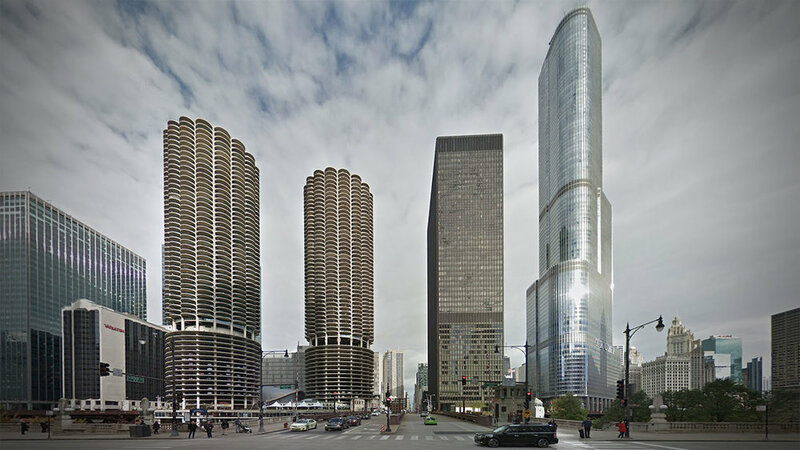 Once I reached Wacker Street the buildings on either side of me would fall away and I’d be treated to a panoramic view of the broad canyon of buildings that lined the Chicago River. It was a beautiful sight to behold, and there for a while I was able to see it every day. Apparently I’m not the only one to appreciate the beauty of this urban space. Hollywood producers find it particularly cinematic as well. That’s why it has appeared in (and been destroyed in) a number of movies in the past several decades. I recently came across a short video that illustrated this phenomenon quite well and thought it was worth sharing. For what it’s worth I worked in the IBM Building and so had a great view of the Marina City. The office where I worked used to have a great view east down the river towards lake Michigan but a large building built by a notoriously shady developer has since been built that blocks that once amazing view.